Bendable portable keyboards for use with computers and other electronic devices are already on the market, but they have limited flexibility, and they're fairly sizable when rolled up for transport. Now researchers have crafted an inexpensive keyboard that is so tough, flexible and thin that it can be crumpled up and tucked in a pocket without damaging it. The study appears in the journal ACS Applied Materials & Interfaces. Existing keyboards incorporate either rigid push buttons inserted in a rollable sheet or a tactile sensor array patterned on a multilayered soft sheet. These devices require complicated fabrication processes, and because of their brittle components, can only withstand a slight amount of bending or rolling. But Keemin Sohn, Ji Sik Kim, Kee-Sun Sohn and colleagues wanted to develop a keyboard that could withstand the rigors of everyday life, including complete folding and harsh crumpling. The team based the device on a sensor sheet they had previously developed. 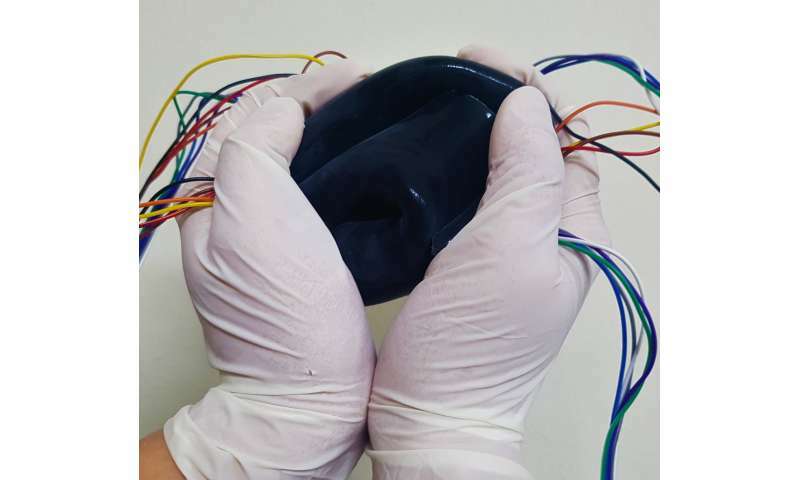 Here, they used a sheet of soft Ecoflex silicone rubber embedded with conductive carbon nanotubes that respond to the push of a finger by changing electrical resistance. To guide users where to press, the researchers drew squares on the surface of the sheet to represent keys for each letter, number or other character. 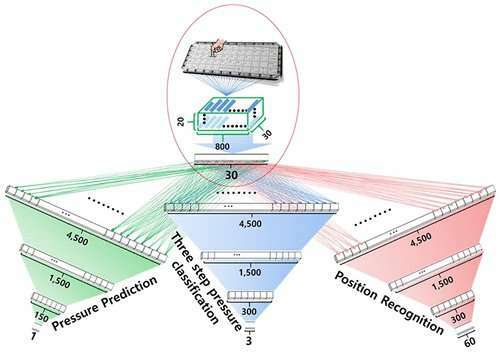 They used an artificial neural network to teach the keyboard to identify the intended letter or character based on the location and pressure of pushes—and associated changes in resistance—on the keyboard. They state that their simple keyboard worked perfectly and outperformed all existing portable keypads in terms of functionality, flexibility, disposability and cost. In fact, each keyboard would cost only $1, cheap enough that it could be tossed out and replaced if it stopped working. An extremely simple bulk sheet made of a piezoresistive carbon nanotube (CNT)-Ecoflex composite can act as a smart keypad that is portable, disposable, and flexible enough to be carried crushed inside the pocket of a pair of trousers. Both a rigid-button-imbedded, rollable (or foldable) pad and a patterned flexible pad have been introduced for use as portable keyboards. Herein, we suggest a bare, bulk, macroscale piezoresistive sheet as a replacement for these complex devices that are achievable only through high-cost fabrication processes such as patterning-based coating, printing, deposition, and mounting. A deep-learning technique based on deep neural networks (DNN) enables this extremely simple bulk sheet to play the role of a smart keypad without the use of complicated fabrication processes. To develop this keypad, instantaneous electrical resistance change was recorded at several locations on the edge of the sheet along with the exact information on the touch position and pressure for a huge number of random touches. The recorded data were used for training a DNN model that could eventually act as a brain for a simple sheet-type keypad. This simple sheet-type keypad worked perfectly and outperformed all of the existing portable keypads in terms of functionality, flexibility, disposability, and cost.